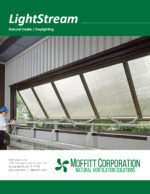 The LightStream hinged window is suitable for commercial to industrial applications. It mounts low on the wall for cool, fresh air intake, or up high to allow for warm air to exhaust. When it is closed it provides ample natural daylighting through its translucent panels. An extruded aluminum framework houses light-emitting polycarbonate panels. The reliable rack and pinion operating system, manual or motorized, allows for easy opening and closing. The operator is designed to work even with long runs. Each LightStream unit ships in factory assembled sections. Each section easily locks together to form continuous runs. The LightStream is designed to be mounted on the building's sidewall at any elevation.